Description: Our flyer printing service gives you A7, A6, A5 and DL flyers printed in full colour on both sides in 12 hours or less. If you need your flyers in hours not days for your organisation - whether you sre a small business, university, club or school - we are able to offer a very rapid express service, in just hours your quick flyers can be ready for pick-up or ready for despatch on the next available courier. 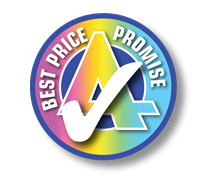 For low-cost, two-sided colour flyers for any purpose, Azimuth Print can help in 12 hours or less. We offer flyers in a variety of sizes and quantities with an express service - and we can even come up with a great design for them if you wish (for extra charge). Call now and see how soon your flyers can be ready, you may well be surprised. Often it can be in as little as 4 hours. All our products are printed on our own presses in Bristol we do not outsource like many of our competitors, we are not a reseller. Very rapid, very quick flyer printing are our speciality! Our full colour speedy flyer printing service gives you quick flyers printed in full colour on both sides, they are printed on a 300gsm gloss art board from eco-friendly sustainable sources. Flyers orders placed from 6.30am Monday until 7.00am Friday will be ready to pick up 12 hours later, or even sooner from our premises in Bristol. 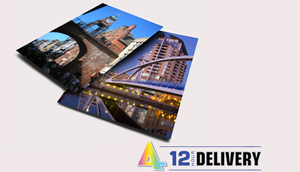 Alternatively we can despatch the flyers from our premises by next day courier at no additional cost.